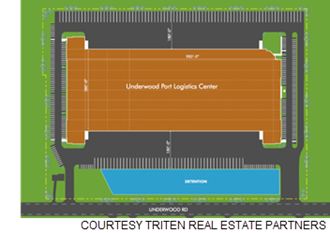 ​​​​​ LA PORTE – Houston-based Triten Real Estate Partners, in partnership with The Carlyle Group, broke ground on a 404,160-sf distribution center at 4600 Underwood Rd. The 25-acre property will deliver in first quarter 2019. The building will offer 36-foot clear height ceilings, clerestory windows, and full overhead dock door packages. ​Check out Houston-The Woodlands-Sugar Land Industrial Market Research​.